After their only child, Eddie, is murdered by a group of young boys, Rob and Becky buy a house to fix up, hoping it will help them get through the agony of losing their son. While renovating, they find a room that is not in the plans of the house. They call it “The Quiet Room,” because the room is completely sound-proof. Nothing can be heard in there, not even the sound of one’s own voice. Rob starts dreaming about the room and comes to believe there’s something evil inside. But Becky believes her son is in the room, so she starts spending a lot of time in there. Rob worries for Becky’s mental health and safety but she refuses to accept there is anything wrong with the room. 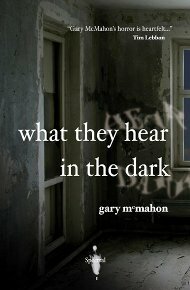 What They Hear in the Dark is a sad tale of grief and loss, with elements of dread throughout. Although he believes “The Quiet Room” is evil, Rob is drawn to it despite himself. At the end of the story, Rob unfortunately finds out just what lives in the room. I enjoyed this story very much. Gary McMahon’s words flow beautifully; you can feel the emotions the characters are experiencing. And while What They Hear in the Dark is a bit depressing, it is also creepy and chill-inducing at times.